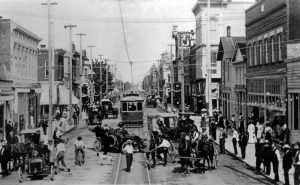 Dates of Operation: Built in 1901 and opened officially in 1902. 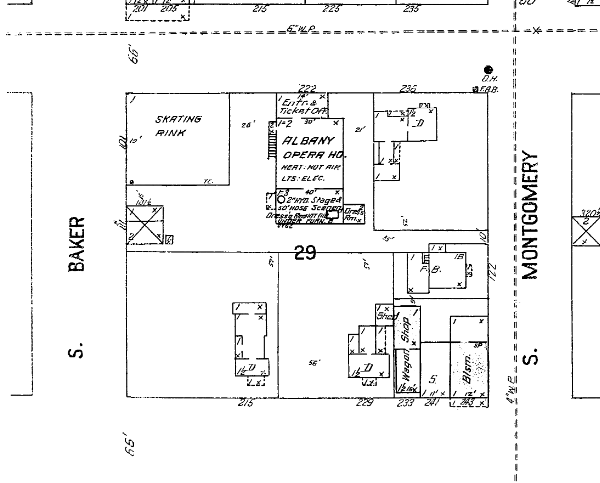 It was sold in 1917 and was renamed to the Family Theater shortly after. Owners/managers: Harry Holmes, T. Orin Barker, I.R. 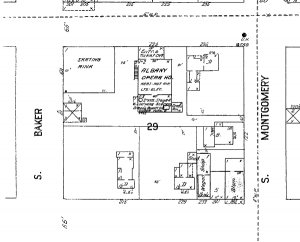 Shultz, F.W. Walters and John W Hogg. Albany Democrat. 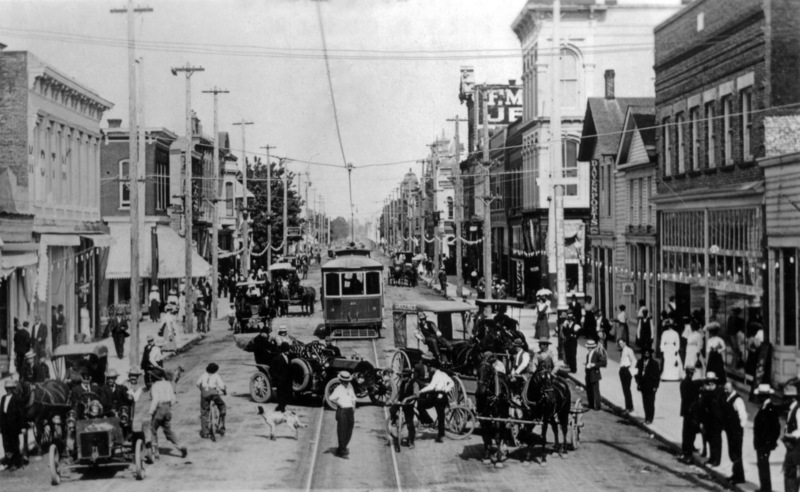 Friday, June 21, 1901. 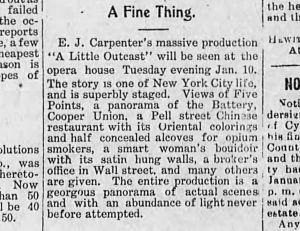 This article clip discusses the seating capacity of Albany’s Opera House which states that it could hold up to 1200 people. 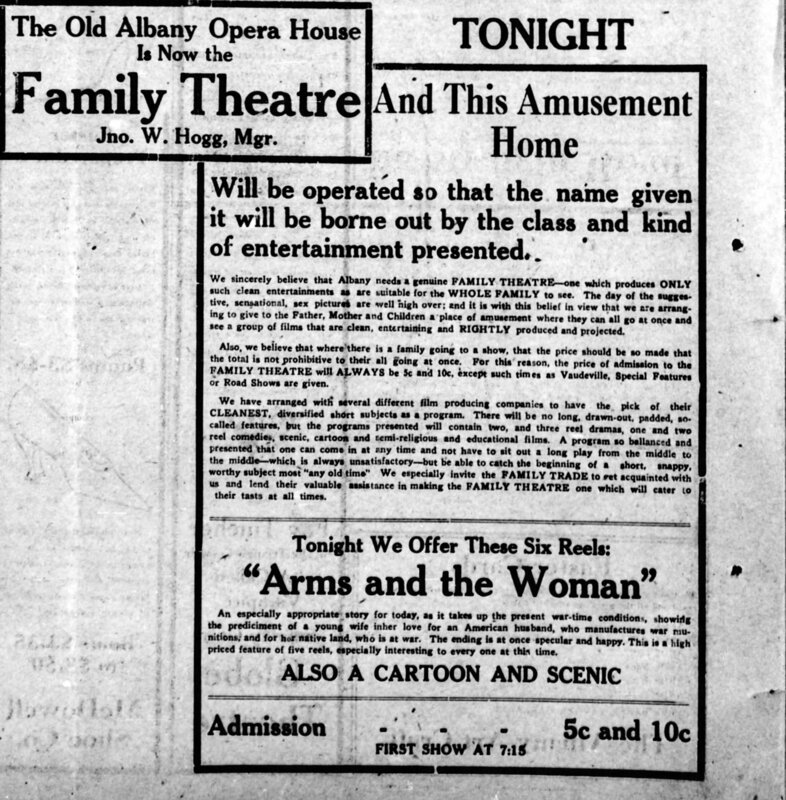 Programming notes: Many different events occurred in Albany’s’ Opera House. For example, orchestra music, vaudeville acts, choirs, religious services, dramas, plays, moving pictures, etc. Prices ranged from 5-75 cents depending on the content/event ($1.36-$20.33 in 2018). Promotional strategies notes: They often included sayings such as “never attempted before!” to catch readers attention. They provided detailed descriptions of the material that was going to be shown as well as follow-ups on how the audience responded to certain events. Also, they included critic reviews of upcoming events/performers. Albany Democrat. Friday, February 3, 1905. 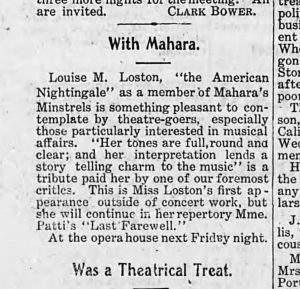 This clip serves as an example of the sort of descriptions that were included in the newspapers about the Opera House. This clip includes who, what, where, and when the event will be held. 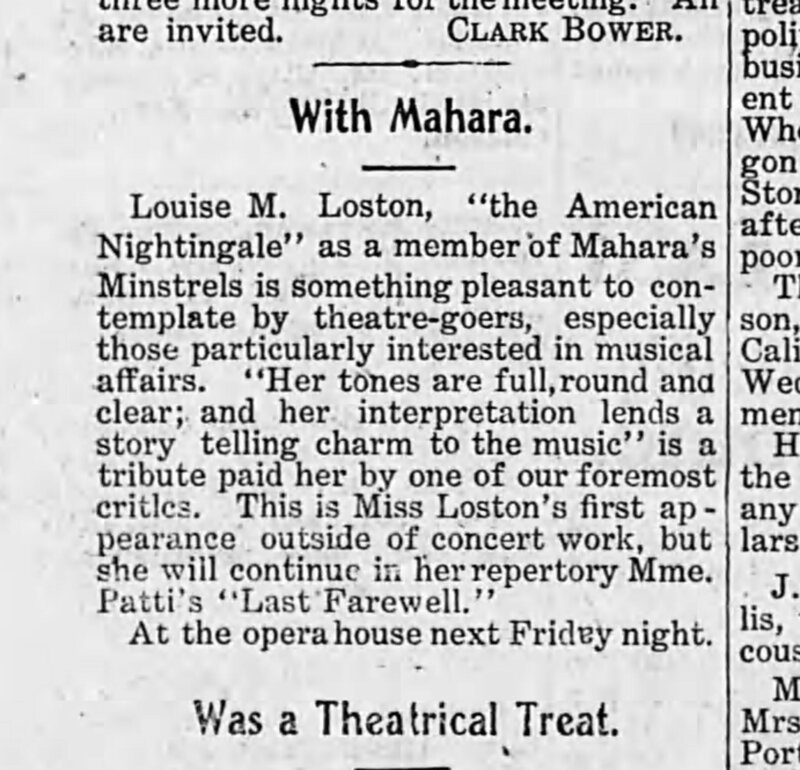 It gives a description about the lady, Louise M. Loston who was a part of the Mahara’s Minstrel, as well as a quote from a critic detailing her talent. It clearly states that this event will be a musical one and that those interested in musical affairs will not want to miss this appearance. Albany Democrat. 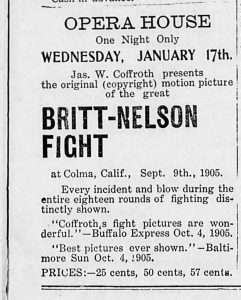 Friday, January 6, 1905. 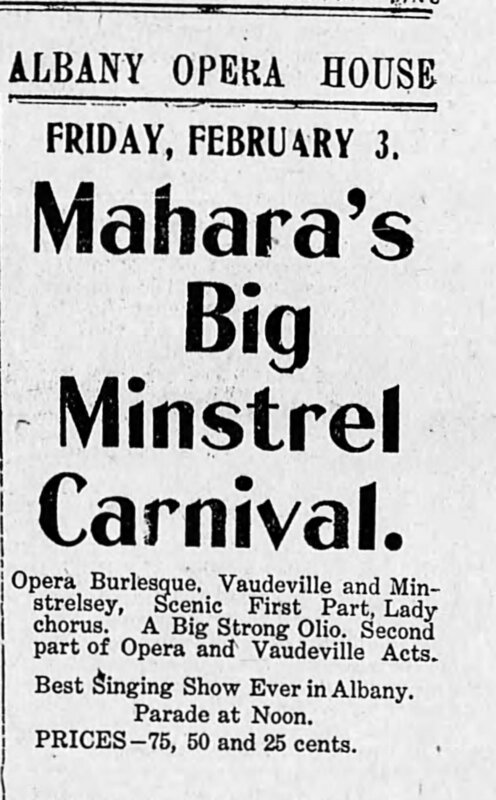 This clip is also an example of the descriptions that were included in the newspapers about the Opera House and the events that were occurring there. 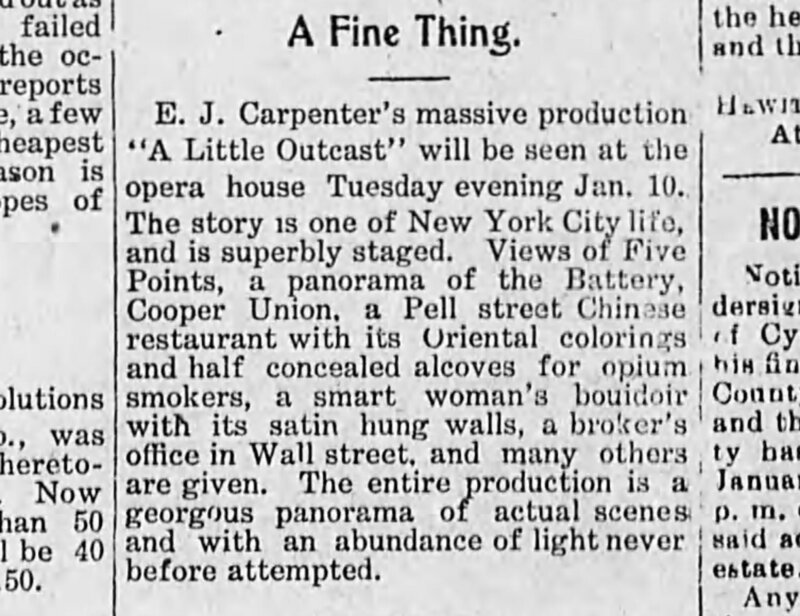 This clip expresses that a panorama of the New York City life would be shown and that there would be special lighting effects that had never been attempted before. This is an example of an advertisement for a carnival that was being held at the Opera House. It states that there would be burlesque, choir, and vaudeville performances. Albany Democrat. Friday, January 19, 1906. 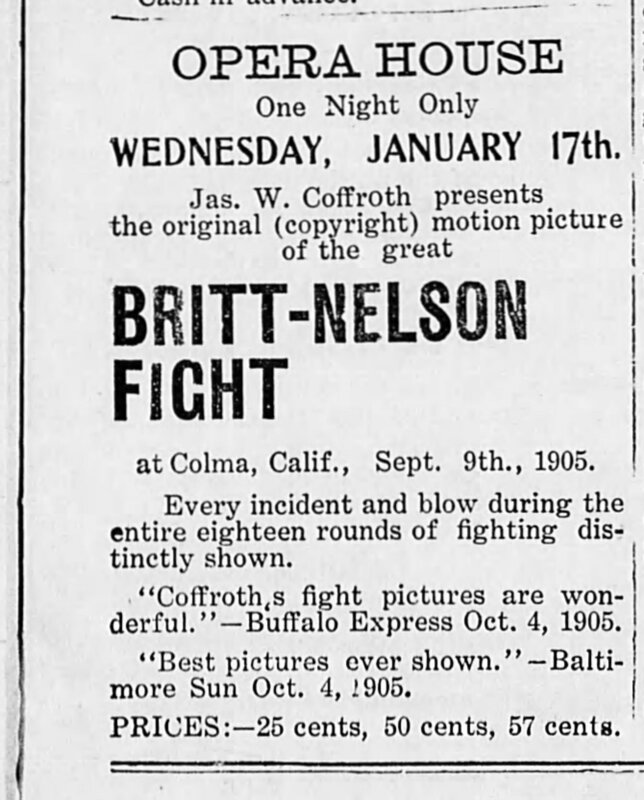 This advertisement is highlighting the fact that the audience will be able to view the ‘Britt-Nelson Fight’ for one night only. Also, I included this advertisement because I thought that the pricing was interesting: 25, 50, and 57 cents. It made me wonder about the random pricing of 57 cents. How and why did they come up with the idea of 57 cents? This was the only time I encountered a pricing such as this one. Albany Democrat. Friday, April 27, 1906. 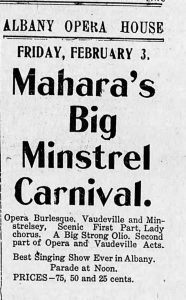 This article highlights the fact that the Opera House was under new management, Harry Holmes, and he promised to provide the audience with the best vaudeville performances that they had ever witnessed before. It also includes the fact that this new manager had made ‘special arrangements’ with the Edison Trust to provide his audience with most recent moving pictures. Albany Daily Democrat. Saturday, March 31, 1917. 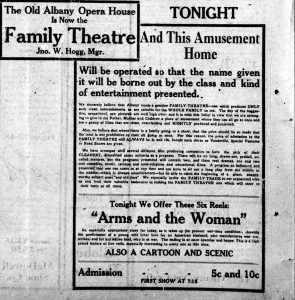 This article shows the transformation of Albany’s Opera House to the Family Theatre in 1917.